I’d only ever seen one Malayalam film before this, the excellent Manichitrathazhu, so I was ready to double my Mollywood count with Kutty Srank. I’d read that the film had won a number of National Film awards in India and had also screened at a number of international film festivals, so it sounded like a good film to catch. I was lucky enough to be able to see Kutty Srank subtitled on the big screen here in Melbourne as part of the Indian Film Festival organised by our friends at India Talkies. Going by the two films I’ve now seen and recommendations from the excellent totally filmi blog I will definitely be watching a lot more Mollywood. 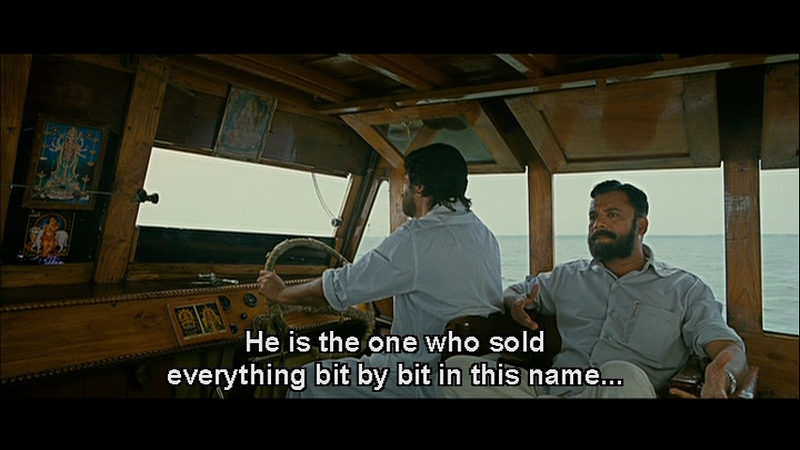 The film tells the story of a disreputable sailor who earns his living working on the rivers of Kerala. We see him through the eyes of three dissimilar women and he is someone different to each of them. The film asks us to decide which of these different personas is the real Kutty Srank. Is he a thug and killer, an actor, a lover or a faithful husband? By the end of the film we even question if he is really dead, despite the film beginning with the discovery of a corpse. The writer/director Shaji N Karun never really answers any of these questions, but allows us to draw our own conclusions as each part of the story unfolds. Revamma (Padmapriya) is the first person to come forward and identify a corpse, which has been found on the beach. She explains her connection with Kutty Srank in a flash back sequence. 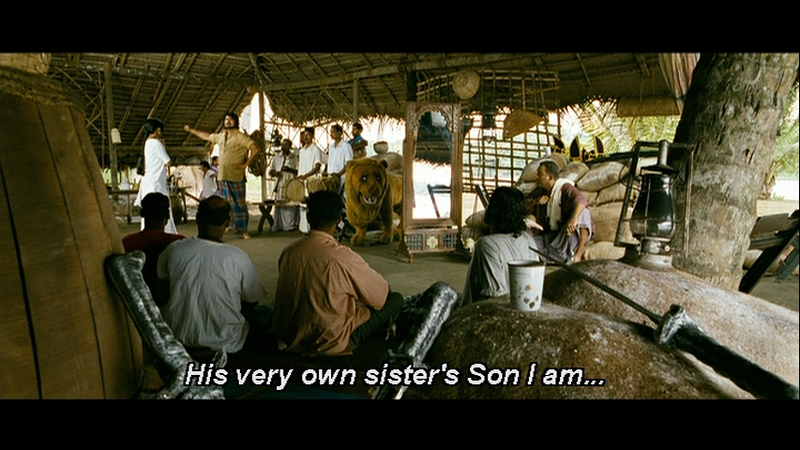 Her father Moopan is the local don in their area near Malabar and is a man literally steeped in blood. Revamma’s memories of her early life are related to blood in some way and blood features heavily throughout the first scenes. Adding to all this symbolism, Kutty Srank has an intermittent nose bleed and his nostrils are permanently filled with the smell of blood. Revamma has returned from studying overseas and overthrows Moorpan’s great plans for her by announcing that she is going to become a Buddhist. Her father’s reaction is fairly predictable but his plans backfire when he uses Kutty Srank to dispose of a Buddhist monk who was with Revamma. Kutty Srank’s loyalty to Moopan is unwavering and unquestioning until this betrayal and Revamma takes immediate advantage of Kutty Sranks despair and confusion, using this vulnerability as a way to engineer her escape. Despite the overly heavy blood symbolism this part of the story is fairly logical and the characters react in understandable if rather extreme ways. Mamooty plays the swaggering thug Kutty Srank to perfection, making him violent but with enough shadows and depth to hint at much more to the man. Moopan’s rather grandiose living conditions are a nice contrast to the rest of the film and his affectations make him easier to despise. Revamma seems to have been driven insane by her early experiences and her behaviour is very irrational and disturbed. The only normal people here are Revamma’s aunt and uncle who seem to be genuinely trying to help her and deal with her father as best as possible. The escape takes Revamma and Kutty Srank close to Cochin where he meets Pemmana (Kamalinee Mukherjee), the second woman who turns up to identify the body. It appears that Kutty Srank has worked as a ferryboat captain in Pemmana’s village previously, but skipped out under dubious circumstances as is his usual habit. He is great friends with Pemmana’s brother, Loni (Suresh Krishna) who picks Kutty Srank to play the lead role in their annual Chavittu Nadakam about Emperor Charlemagne. This traditional drama provides an excuse for some fantastic costumes, singing, dancing and stomping around the stage by the various members of the village. It also allows Mammootty to showcase the more human and fun side to Kutty Srank’s character. Although the menace is still there, the interactions between Kutty Srank and Loni give him an opportunity to laugh, joke and drunkenly sing as they roam around the village. The local priest is not happy to hear of the irreligious Kutty Srank taking part in the play and also taking over the affections of Pemmana. Father Yonas (Siddique) has been enlisted by the feckless Joppan to push his match with her and as Joppan seethes with jealousy, Father Yonas whips up fear and mistrust of Kutty Srank. Tensions escalate in the village and there is plenty of scope for betrayal and murder – it rapidly becomes merely a question of who and when. Moopan’s henchmen also turn up on the river again in a very groovy speedboat. This, along with the death of his best friend, means that Kutty Srank is ready to skip town again. Avoiding the attentions of Pemmana and escaping a murder hunt are purely side benefits. The third woman who turns up to identify the body is a mute, Kali. She has been living with an older woman who has amazing interpretative skills and understands exactly what Kali is trying to say. 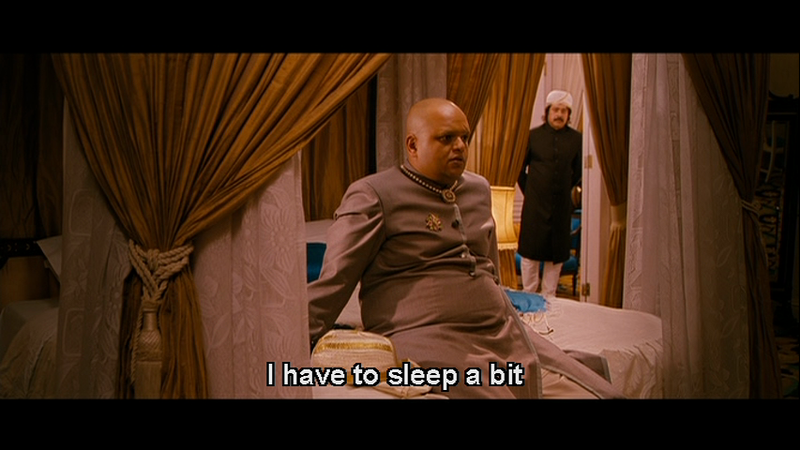 She is introduced as Kutty Srank’s pregnant wife and sensationally states that the body is not her husband. The final flashback tells her story which starts after Kutty Srank has moved on to Travancore trying once again to elude Moopan’s men . Kutty Srank has taken up with Unnithan (Sai Kumar) who presides over an unhappy family where tragedy has been the normal order for the past 10 years. Unnithan blames this on Kali, a local mute who lives in the forest, and has tried a number of ways to be rid of her. As his trusted man, Kutty Srank heads off in a drunken rage to kill Kali but when he finds her and sees her pitiful existence he is unable to go through with the execution. He ends up being cared for by Kali following a snake bite and eventually becomes her husband. We see a more tender and caring side of Kutty Srank through the eyes of Unnithan’s daughter in law Nalini who romanticises the couple in an escape from the misery of her own daily existence. In the end Kali and Kutty Srank have to make a run for it as Moopan’s men have again put in an appearance. The last scene takes place back in the village where the play must go on, and this leads to the final chapter in Kutty Srank’s life. The film hinges on the performance of Mammootty since he’s on screen for almost all the film. In each storyline he brings out the complexities of his character and allows a little more of his inner nature to be revealed. Mammootty brings plenty of physicality to the role and exudes menace and tenderness with equal conviction. He has stacks of charisma and it’s easy to see why the easy-going Loni hails him as a friend and all the woman in his life are fascinated by him. This is the first film I’ve seen with Mammootty in the lead and it’s obvious why he’s such a big star in Mollywood. His co-stars manage to hold their own well enough against the superstar despite their smaller roles. Padmapriya does an excellent job of showing frailty and mental confusion. By the end, her enforced peaceful existence and escape from her father seems to have had an effect and she acts more normally. Kamalinee Mukherjee is fine as the obsessed young girl enthralled by the older man, but her character is more of a caricature. Her actions to get what she wants are appropriately shocking and this gives an unexpected twist to the story. 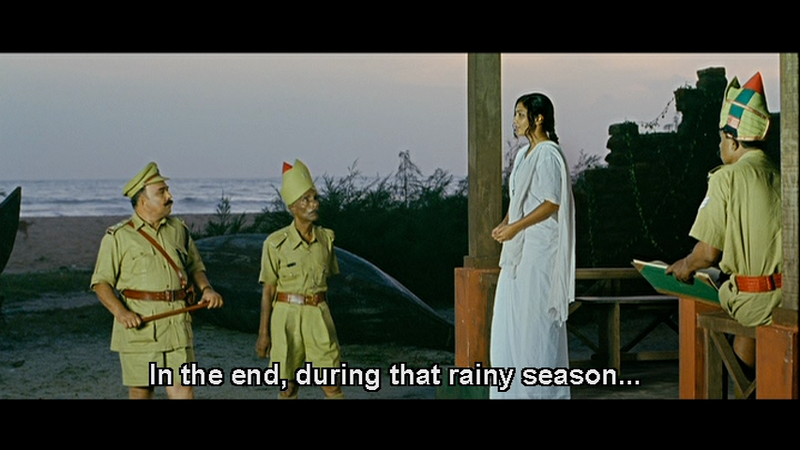 The outstanding performance of the three is by Meena Kumari as Kali. She is impressive as the frightened yet determined woman who finds the inner strength to deal with the frustrations and dangers of her existence. She has enough compassion to be able to love the man who tried to kill her and manages to convey all of this through her facial expressions and gestures alone. The other supporting actors all do well within their roles but apart from the three women, the other characters are all more lightly drawn to ensure that the focus of the film is firmly on Kutty Srank. 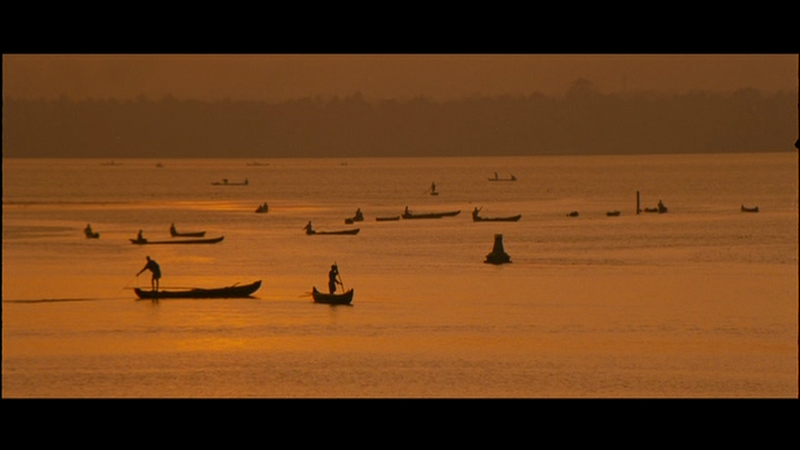 The film excels in the cinematography and the different parts of Kerala are beautifully filmed by Anjali Shukla. The landscape is as much a character in the film as the other actors. It shapes the actions of many of the protagonists and provides both livelihood and death in equal amounts. The film won 5 awards at the National Film awards and has been screened at a number of film festivals. It’s definitely worth catching in a cinema if you get a chance to appreciate the sweeping shots that really highlight the beauty of Kerala. 4 ½ stars. This entry was posted in Mollywood and tagged Anjali Shukla, Kamalinee Mukherjee, Kerala, Kutty Srank, Mammootty, Meena Kumari, Padmapriya, Sai Kumar, Shaji N Karun, Suresh Krishna. Bookmark the permalink. Thanks for this review! This seems like a must watch film. If this is the first time you have seen Mammotty, then I can assume that you haven’t seen the Malayalam film Ore Kadal, which also stars him and Meera Jasmine, and which I recommend highly. But wait. Didn’t you see Kandukondain, Kandukondain? (Tamil movie) Mammotty is in that as well. He’s also the star of Pazhassi Raja, which I haven’t seen, but have read very good things about (it’s a historical). At the beginning of your review I thought this was going for a Rashomon like effect, but it seems to be more continuous and linear than that. Still, it sounds fascinating, and I think Mammotty is a powerhouse of talent, so I will try to get this. Thanks again for the review! I have Pazhassi Raja in the pile to watch so will hopefully get to it soon. It’s not completely linear, but the different perceptions are more how the 3 women see the character of Srank rather than totally different or contradicting opinions, so I don’t think it’s going for a Rashomon effect either. Although that’s just my opinion. I thought it was a fantastic film and kept getting side tracked into rewatching it while I was screen-capping – it’s definitely a must watch! Very nice review, I enjoyed reading it – I first noticed this film when I saw a picture of Mamootty’s uncharacteristic facial hair (which makes him look great, I think!) and wondered what the unusual-sounding title was about. I loved your screencaps- it does indeed look like a beautifully shot film. 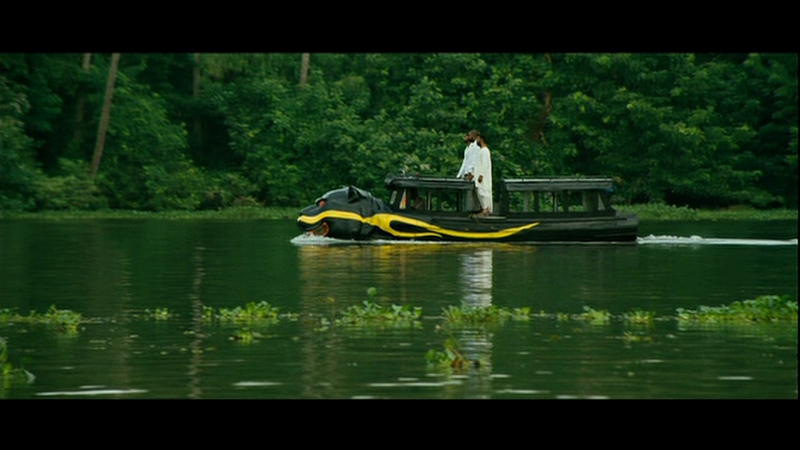 Malayalam films do this so well- perhaps it helps that Kerala is ripe with lush scenery for inspiration. 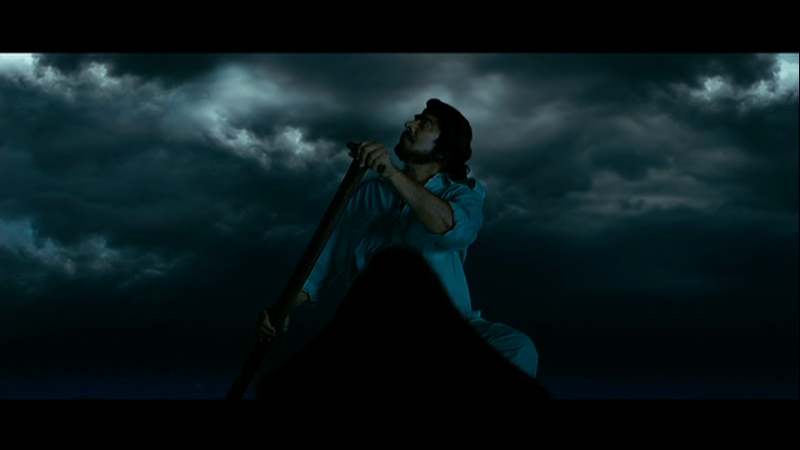 The cinemtography is really outstanding, although as you say I think it helps very much that it was shot in Kerala. I will be watching more Mamootty for sure! Just bumped into your review via IMDB. You have penned it nice. Also you have selected the pictures carefully .I have already seen the movie and it is a good piece of art. I am lover of good movies and this definitely goes into it. This movie has some really touching & catchy scenes especially the one when mammootty cries when loni is taken away. From a box-office perspective the movie didnt do well but I guess thats more of a perception than people attempting to see it . Though the movie is considered to be a non-commercial movie , I felt that it was an interesting one. Just a note to you – If you havent seen Mammootty much try to watch some of his earlier works – “New delhi ” ( a commerical movie), Oru Vadakkan Veeragadha (mainstream – a folk story) , Thaniyavarthanam (This will make anyone weep) , Sukritham and the recent ones like the “Paleri Manickyam oru paathira kolapathakathinte kadha” and “Pranchiyettan and saint”. These would definitely show his versatality. I really appreciate the recommendations as well – thank-you for those. Mammootty has made so many films its hard to know which ones to watch next. I will look out for these and report back! The ones suggested by rad are also great! Thanks for the recommendation – it sounds like a good film. I’ll certainly add it to the ‘mammooty-films-to-be-watched list’! Nice perspective and well written with appropriate videos /photographs. 2) Perception that Shaji wants the user to feel when in the radio there is a mention of train accident and the viewer thinking unnithan’s son is dead making unnithan’s beleif that kutty srank also is a curse now but the truthy is unnithan’s son hasnt gone to Kasi! 3) We actually dont know whether pennama killed the villain in that episode as it could be that Mamooty goes to the sea after the drama as he is shown as dead based on the drama costume..